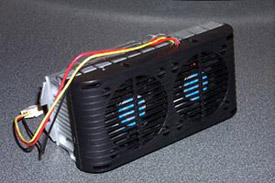 Abstract: The Dual Overkill is a PIII SECC2 cooling rig, worth looking at twice with its twin 50mm fan powerhouse. Read the review! There are many avid overclockers out there today. The number one reason for overclocking has always been to save same cash. Therefore it is sometimes disheartening to find out that many overclockers go overboard with their cooling purchases. So here's the situation, you have recently purchased a slot 1 Pentium III processor, and are planning to overclock it. If you have purchased an OEM CPU, then you obviously have nothing to work with. However users that have purchased a retail boxed processor are endowed with a rather anemic heat sink and fan combination that is usually only fine for standard CPU speeds. For the OEM CPU situation, you are forced to either buy a CHEAP heat sink, or you can venture online and purchase a nice aftermarket cooler. With the Retail CPU, you can try overclocking with the Intel heat sink and fan, and you may very well reach high speeds. But stability might be an issue, so you are forced to raise the voltage, and then you find that the temperature is a bit high. Then paranoia sets in, and you now feel the need to get a better cooler just to keep the temperature down. After having the Double Whammy for sale for a while, we had to think of an acceptable name for this. We decided on the Dual Overkill, since it has two 50x50x10mm fans, and is overkill cooling. This will cool down any CPU to chilly temperatures, without a steep $60 price. Why buy a fat Alpha that won't fit when ours does just as good? The Dual Overkill is the top of the line SECC2 fan for any application. This is the fan we strongly recommend for overclockers. An older model of this fan was independently tested by HardOCP to perform up to 6 degrees (F) cooler than the TennMax P3-TF! With better performance on this than the old one, our new one is even better! This is the only way to go. Double Ball-Bearing for superior life! "Super Case" -- Midtower with an Enermax 350 Watt power supply. Let's examine the heat sink carefully, as you can plainly see, there is the dreadful, awful, thermal pad. Naturally I scraped it off using the most modern tool available to me (my fingernails.) With the annoying thermal pad gone, I applied a very thin layer of Silver Thermal paste to the CPU contact area. I initially attempted the big 150 MHZ overclock at first (600MHZ.) I booted into Windows'98 at 2.05 V (the default voltage for Intel PIII Katmai 600 Processors.) But Quake III would lock up in 3 seconds. I tried 2.1V, Quake III would reboot the system, the same thing happened at 2.2V and 2.3V. Raising the voltage did help to stabilize Quake III, but at 2.3V it would reboot in 5 minutes. At 2.3V the processor reached 41C quickly. Therefore I am not ruling out that an Alpha P3125S would've rectified the situation. Alternatively it is entirely possible that the CPU just can't handle it J . It just seems strange that a CPU that can at least boot into Windows at "default" voltage, cannot be stabilized through voltage adjustments.